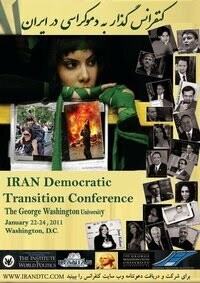 This weekend I attended and spoke at The Iran Democratic Transition Conference in George Washington University. 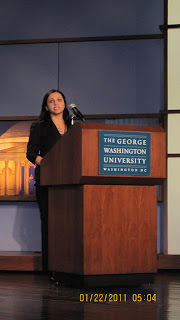 The conference was organized by The Institute of World Politics and The Confederation of Iranian Students. I attended as an independent activist and with an open mind; because I believe that if we want to promote democracy we have to start practicing it today! Although this was a very controversial conference, and I had received numerous calls from various political activists urging me not to attend, I decided to attend and judge for myself. While this conference had the potential of accomplishing something very useful and positive, unfortunately it fell very short of that goal. Overall the goal of the conference seemed to be the self promotion of “The Confederation of Iranian Students” as well as an undertone of reformist propaganda. One of the speakers on this panel was Mr. Amir Golparipour, a former secretary general of Islamic Student Association in Tehran University, and a member of Mousavi’s central campaign. While Mr. Golparipour did not openly support Mousavi, he stated that “the people in Iran are leading and Mousavi is following.” He also stated that young people were interested mostly in their own individual rights such as the right to dress the way they want, or be able to see their boyfriend/girlfriend without the fear of repercussions. He minimized the political demands of the younger generation and tried to reduce it to simple individual demands. Others on the panel included Jane Kokan, Nahid Kalhori and Amin Karimian. Panel 2-Oppositions Leadership: In Exile or from Within? The speakers on this panel included Amir Shajareh from Pars International Television, who was one of the few speakers at this conference who took a clear stand against the Islamic Regime. Speakers in this panel included Ivan Marovic, one of the founders of Otpor, the Serbian political student movement, Jamie Tronnes, International Republican Institute’s Deputy Director for Africa and Robert Benjamin, National Democratic Institute’s Director of Central and Eastern Europe. Panel 4-New Constitution- Reform or Regime Change? I was one of the speakers on this panel and I will be posting the text of my speech on a separate post along with pictures. One of the speakers on this panel was Mr. Afshin Ellian, a professor of law and philosophy from Netherlands. Mr. Ellian was another speaker who stated that it did not matter what Mousavi had done in the past, that he was currently doing a good job and that people had “chosen” him as a leader, therefore we should not create division and we should stand together. Mr. Ellian did not answer my questions directly, instead he talked about how difficult it would be to prosecute these people, how most likely they would destroy all the evidence and how it would cost millions of dollars... Mr. Ellian also denied having said that we should forget about Mousavi’s past. I was forced to get up once again and remind Mr. Ellian that in fact he had said that very thing, and that he had not in any way answered my questions. Panel 7-Sanctions: Behaviour Change or Regime Change? The reality is that millions of Iranians were pouring into the streets and protesting, the movement was becoming more and more radical and the end of the Islamic Regime was and still is in sight. What better way or time for an Islamic Regime diplomat to “resign” in order to guarantee his safety, and to protect himself from any possible future prosecution after the Regime is overthrown? These types of resignations are at best self serving and opportunist, however it seemed like I was the only one at this conference who felt this way... Mr. Fakhravar was busy praising Mr. Eslami at every opportunity and the audience were clapping for him at every opportunity, treating him like a hero, rather than a self serving opportunist who had quit his post, at a very convenient time. Another person who attended the conference, but did not speak was Mousavi Khoeini, a former reformist member of parliament who currently lives in Washington DC. Mr. Fakhravar was also quick to praise Mr. Khoeini for following up with the demands of the students, while he was the Member of Parliament, and once again applause followed. For me the most alarming part of this conference was not only the presence of these former Islamic Regime officials, but the way they were constantly praised and treated like heroes. The fact that some Islamic Regime officials are resigning is no doubt something useful and positive for the peoples movement, but let us not have any illusions. If people, who have been working for the Regime for so many years, without any cause for concern for the rights of people, are resigning today, it is because it benefits them first and foremost. 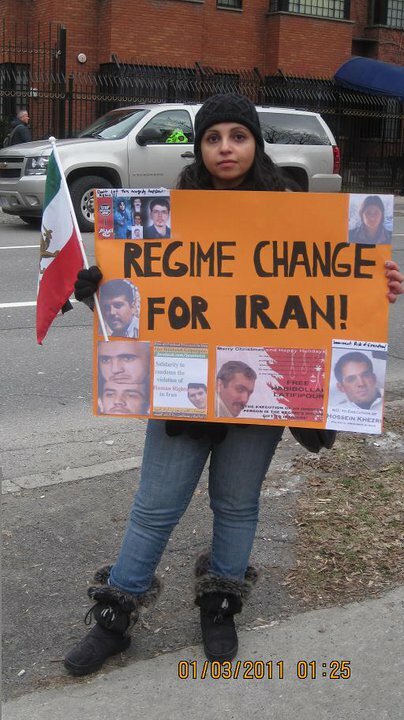 It takes their future into guarantee and allows them to live in a safe third country, which they would not be allowed to do, if they were still working for the Regime when the Regime is overthrown. These individuals are not hero’s and should not be treated as such; at best they are opportunists who should help the people’s movement and beg for forgiveness, rather then being treated like heroes. Overall, the focus of the conference was more on the Confederation of Iranian Students with a reformist undertone. I for one was not able to stomach a third day among individuals such as Mr. Eslami or Mr. Khoeini and did not participate in the last day of the conference. I hope in the future we can have conferences with a focus on Regime Change without a reformist agenda. Hundreds of activists came together today (January 20th 2011) in the city of Soleymaniye in Iraq, to protest against the execution of Kurdish political activist Hossein Khezri who was executed, without notice on Saturday January 15th 2011, as well as about the possible imminent execution of other Kurdish activists including Zeynab Jalaliyan, Habibollah Latifi and Habibollah Golparipour. Please find below pictures from this protest. 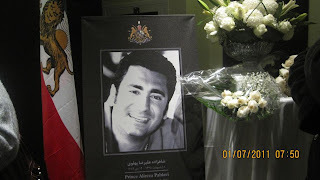 Tonight I had the pleasure of attending an event in honour of Shahpour Alireza Pahlavi, which was organized by the “Movement to Support Freedom in Iran.” This event set itself apart from other events that have been organized in honour of Alireza Pahlavi in Toronto, because it was announced from the very beginning that this was a “political” event. This was a welcome change, it was honest and upfront; how can the death of a young man, who loved Iran and spent years of his life studying its history and civilization be anything but political? 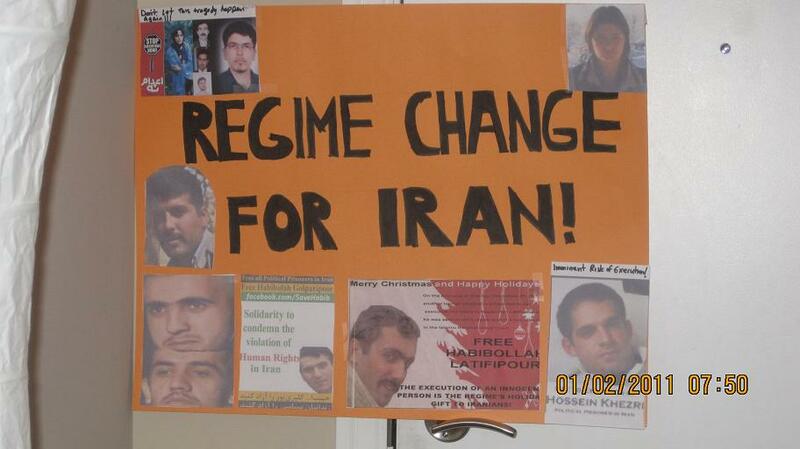 Tonight we heard from a number of Toronto activist who shared their love for Iran and sympathies for the Pahlavi. The key speaker tonight was the renowned Dr. Massoud Ansari who is well known for his opposition to the Islamic Regime, and Islamism which he stated was the root to the current troubles we are having in Iran. One of the most important things Dr. Ansari said tonight was that the Mullah’s are the “waste” the “vomit” that has come out of Islam. If we remove the Mullah’s they can be replaced by the Sheikh, and if the Sheikh is removed it can be replaced by another Islamic “persona.” It is necessary for the root of the problem to be removed from the Iranian society; the minds of the Iranian people must be free from superstition and the Islamic mentality before we can have a free Iran. 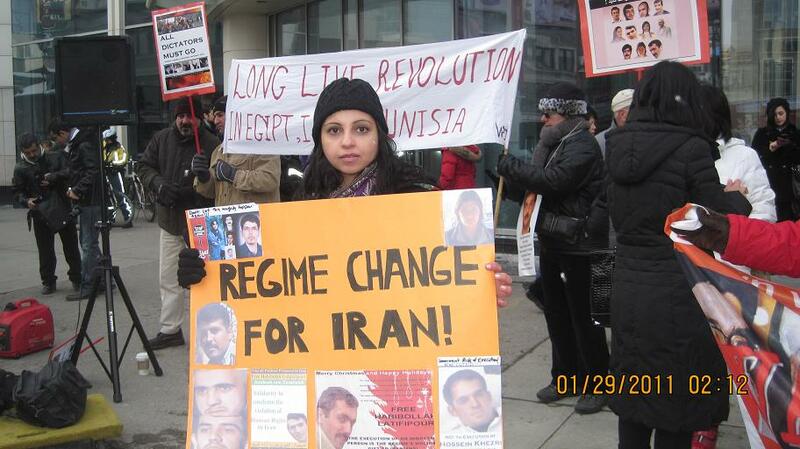 This was the first event I have attended in Toronto in a long time where speakers took such a clear stand against the Islamic Regime and the Islamic ideology, and it was truly a welcome change from the general “non-political” events. My sympathies are with the Pahlavi family who have lost a loved one, as well as with the families of all activists who have been executed or lost their lives in one way or another at the hands of the Islamic Regime including Hossein Khezri a Kurdish activist who was executed on Saturday morning. According to various reliable news sources, a prisoner was executed in the Orumiye Prison this morning. 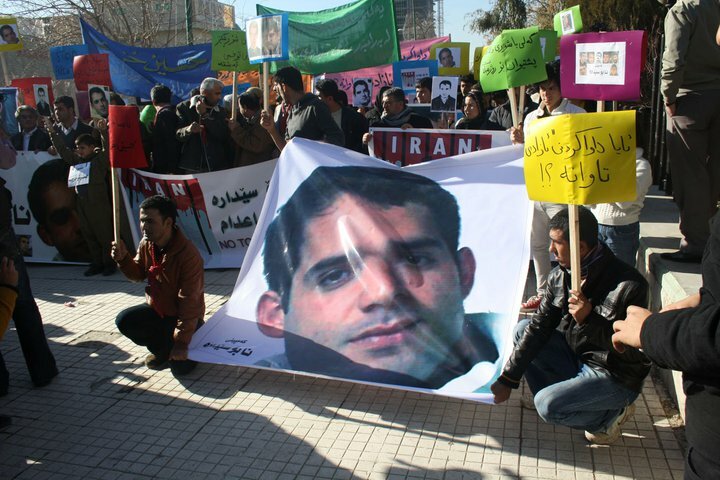 Although the name of this prisoner has not yet been confirmed various websites have reported that the person executed may very well be a Kurdish political activist and prisoner Mr. Hossein Khezri. There is still a question mark, as numerous news sources have reported in the past few weeks that Mr. Khezri had been removed from Orumiye Prison and taken to an "unknown" location. Mr. Khezri's brother has denied any knowledge of his execution this morning, and has stated that there is no news from his brother to confirm whether he is alive or has been executed. This is yet another tragic news coming out of Iran , and although the identity of the individual is yet to be determined, it is confirmed that someone was executed this morning. I urge everyone to be cautious when reporting on today's execution and hold off on announcing that Hossein Khezri' has been executed until the news is actually confirmed by a reliable source such as Mr. Khezri's family or lawyer. I certainly hope that it is not true and will be keeping Mr. Khezri and his family in my thoughts today. I will post any new developments as I receive them. 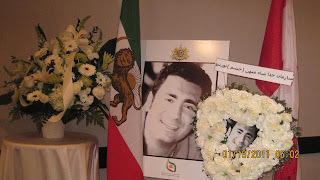 Tonight hundreds of Iranians gathered in the Westin Prince Hotel in Toronto to commemorate the passing of Shahpour Alireza Pahlavi, the second son of the former Shah of Iran. It was a wonderful event, where people from clearly different political and ideological fractions came together to mark this very tragic event. Shahpour Alireza Pahlavi, was highly educated, and loved Iran very much, these are two things that can never be disputed. It is still difficult to believe that Mr. Pahlavi took his own life and I am truly saddened by this tragic event. As always I want to remember all of the brave young men and women who in one way or another have lost their lives in the past 31 years at the hands of the Islamic Regime. Let us also remember that together we are strong, and a united front is the best way to free Iran from the hands of the tyrannical Islamic Regime. My sincere condolence and sympathies go out to the Pahlavi family and the Iranian nation. The news of the death of Shahpour Alireza Pahlavi, the younger son of the late Shah of Iran came as a great surprise and disappointment. I am still having a difficult time believing that he committed suicide, and feel truly sad for the loss of a young man who truly loved Iran. My condolence to Alireza Pahlavi’s family, friends and loved ones. 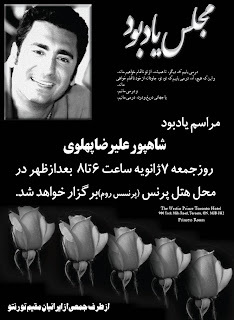 A memorial service has been organized in honour of Mr. Pahlavi in Toronto on Friday January 7th from 6-8pm in the Westin Prince Toronto Hotel, for anyone who might want to attend and honour his memory. As promised I am posting pictures of yesterday's protest in front of the Islamic Regime Embassy in Ottawa,in support of Habibollah Latifi and other political prisoners facing imminent executions. Vidoe of my speech in support of Habibollah Latifi and other political prisoners facing imminent execution. 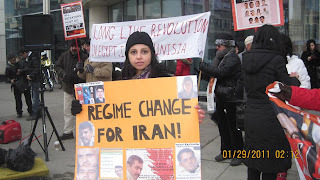 Today (January 3rd 2010) I attended a protest which had been organized by leftists activists in front of the Islamic Regime Embassy in Ottawa. The protest lasted an hour from 1-2pm and despite the bitter cold tens of activists, many of whom including myself had travelled from Toronto gathered in front of the Embassy to show solidarity with Habibollah Latifi a Kurdish student activist who is facing imminent execution. I had the opportunity to speak briefly at the protest and I started with saying that even though we were there with different political stands and may not agree on many things, we defiantly agreed on one thing, and that was that the Islamic Regime is not capable of reform and that it must be overthrown by the people, Regime Change is the only viable option for the Iranian people. I also spoke about Habibollah Latifi and other Kurdish activists including Hossein Khezri, Zeynab Jalaliyan, Shirkoh Moarefi, Habib Golparipour and all other activists who are facing imminent execution. I also urged everyone to remember and condemn the recent wave of arrests in Sanandaj. (will post the video soon). A big thanks for everyone who took part in the protest and in hopes of a free, secular and democratic Iran in the very near future. There will be a protest tomorrow in front of the Islamic Regime Embassy (245 Metcalf street) in Ottawa, Canada from 1pm-3pm in support of Habibollah Latifi a Kurdish student activist who is facing imminent execution as well as other Kurdish activists such as Hossein Khezri who may be in danger of execution. In light of recent political executions in Iran including the execution of Mr. Ali Saremi a long time political activist who had spent more than 20 years in Islamic Regime prisons, as well as in light of recent wave of arrests in Iranian Kurdistan, I urge all freedom loving people Iranian and non-Iranian to please join us and show your solidarity with the Iranian people and especially with those activists who are facing imminent exectution.